Henriqueta Cristina, author of 3 Balls of Wool. 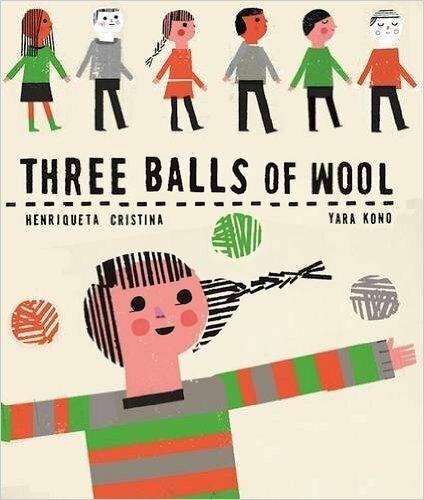 A few months ago I connected on Facebook with Henriqueta Cristina, the author of Com 3 Novelos (o mundo dá muitas voltas) a book I’m translating for publication by Enchanted Lion in 2017 under the title 3 Balls of Wool. Henriqueta lives in Coimbra, a city that Richard and I visited last year and loved for its architectural restoration and academic ambiance. Coimbra is only an hour by train from Porto, where Richard and I visit our friends Lígia and Jorge every year, so Henriqueta and I made arrangements to get together. 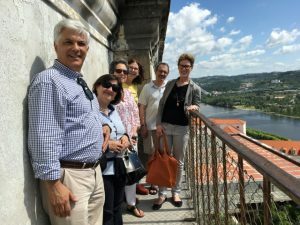 In the meantime, my friend and VCFA classmate Sandra Nickel decided to meet me in Porto, so I asked if she would be interested in traveling to Coimbra and meeting another children’s author living in Europe. 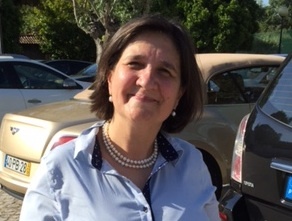 Sandra lives near Geneva, Switzerland and is an active member of the International Chapter of the Society of Children’s Book Writers and Illustrators and a frequent SCBWI conference presenter. Portugal currently has no SCBWI members, but I’m trying to change that with my growing number of contacts among Portuguese writers and artists. 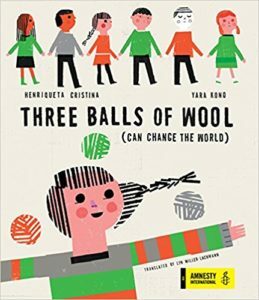 In addition to Henriqueta and the illustrator for 3 Balls of Wool, Yara Kono, this trip introduced me to illustrators Madalena Matoso and Bernardo L. Carvalho and authors Richard Zimler, Ana Maria Magalhães, and Isabel Alçada. I’m bringing back five of Richard Zimler’s books to explore possible publication in English. When we arranged our meeting, Henriqueta mentioned that her husband teaches at the University of Coimbra and would be joining us, along with two other friends of theirs, Angela (her teaching colleague) and Regina (a visiting professor from the University of São Paulo). Sandra, Richard, and I had no idea of the treat we had in store! Our group on a balcony at the university, from left: Raimundo, Henriqueta, her teaching colleague Angela, me, Richard, Sandra. Photo by Regina de Oliveira Moraes. Her husband, Dr. Raimundo Mendes da Silva, is a professor of civil engineering and the coordinator of the university’s nomination as a UNESCO World Heritage Site. Last year when Richard and I visited, we saw posters celebrating the UNESCO designation, and this year we received an inside look at all the work that went into this. 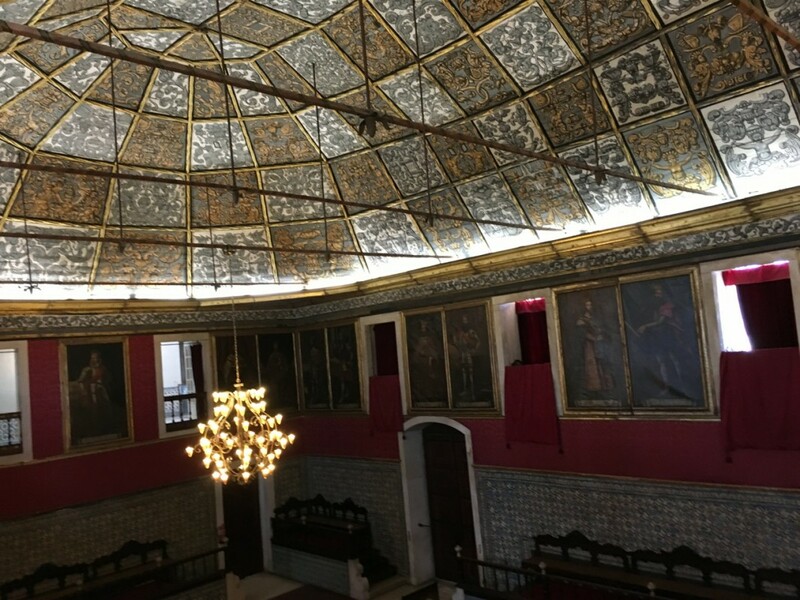 The restoration of the university, which is more than 500 years old, required the coordination of many academic departments and the efforts of hundreds of volunteers who carried out much of the work in the face of the financial crisis, global recession, and austerity. The renowned Joanina Library was our first stop. Raimundo showed us that the walls and archways, which looked as though they were made of marble, were in fact wood painted to resemble marble. Marble is not a good choice for a library because it doesn’t absorb moisture and in fact creates condensation with changes in temperature. Condensation – and water in general – is bad for books. Wood is by far the best material because it expands and contracts with changes in temperature and moisture and thus regulates humidity inside a building. Other natural protectors of the medieval books include bats to eat insects. Insects are among a book’s worst enemies; in fact, the reason libraries don’t allow users to eat and drink is not that clumsy readers can spill things on books, but that sticky liquid and crumbs attract silverfish, cockroaches, and other pests that can turn a book into a pile of dust. The university chapel with an organ that proved too large for the space. Photo by Sandra Nickel. Below the ground floor level of the library, we saw a room of offices and the academic prison, where Raimundo said students who destroyed books were confined. In fact, the academic prison, which was used from the sixteenth to the nineteenth century, housed students who committed a variety of infractions, since the university was responsible for the conduct of those on its campus. There was a debate among those responsible for the restoration about exposing the brick ceiling of the downstairs offices. Exposed brick has become a desired feature in the real estate world, but Raimundo observed that exposure leads ultimately to degradation and those thin bricks of the sixteenth century were meant to be covered in plaster. For now, the brick is exposed. We then saw a tower that had fallen into disuse over the years, so much so that vegetation grew on its roof and in cracks in its walls. It is never good to have vegetation of any kind growing on your roof, walls, and interiors. (That includes ivy and other vines that make old buildings attractive but are oh so destructive.) The tower’s cleaning and restoration involved scores of volunteers, most of them students, scrubbing the walls and cracks with a soft toothbrush. Not a medium or firm toothbrush – a soft one. A ceiling designed to resemble an upside-down boat. 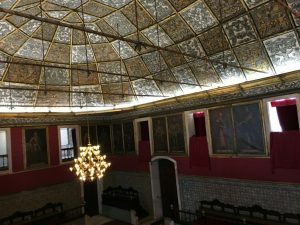 The exam room at the university had a ceiling made to look like an upside-down boat, a common feature of ceilings in Portugal’s important civic buildings. (We saw another one in a municipal building in Porto.) Raimundo mentioned that in previous centuries, the king’s ministers would stand at the balcony and spy on professors and students. In a cloister we saw several columns with metal braces. These columns had cracked, and the university’s architects and engineers were still trying to figure out how to fix them. So the question “What do you do when your column cracks?’ doesn’t yet have an answer. The one thing they don’t do is stand around the cracked column and cry, which is what I probably would have done if it had been my column. 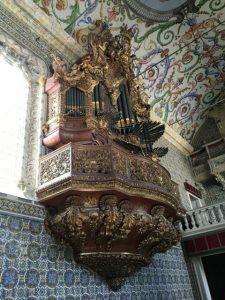 The cooperation and can-do attitude of the various architecture and engineering departments at the University of Coimbra – Portugal’s highest rated university and the third highest-rated university in the Portuguese-speaking world – have led to the prestigious UNESCO World Heritage Site designation. I am sure that in the coming years, these leaders in the field of restoration will find a solution to the cracked column, saving valuable structures from becoming tomorrow’s ruins. 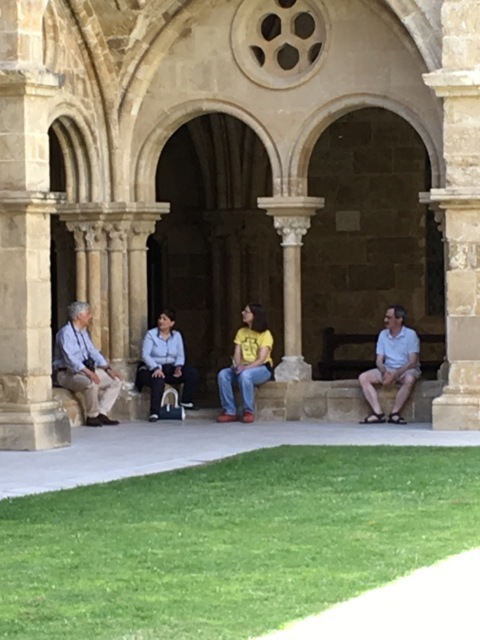 At the cloister with Raimundo, Henriqueta, and Richard. Photo by Sandra Nickel. What an incredible tour Raimundo and Henriqueta gave us! 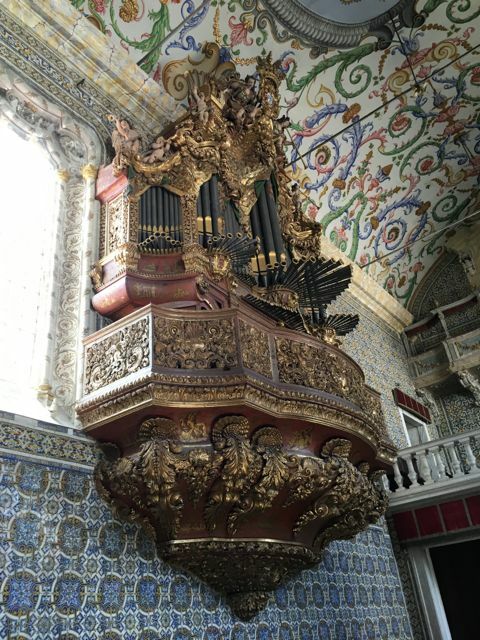 If anyone has a chance to visit Coimbra, do! You won’t be disappointed. It is steeped in glorious architecture and history–and generous people. Raimundo’s tour was without rival the highlight of my trip to Portugal. Thank you so much, Lyn, for these memories–and thanks to Raimundo, Henriqueta, Angela and Regina for an unforgettable afternoon. Here’s a toast to the writers of children’s literature, the books they write, and the incredible community they create. Thank you for your comment and for joining us on this journey! I’m so glad you enjoyed it, and perhaps one day the restoration will turn up in one of your stories!